Thailand's Koh Samui lures visitors in search of white-sand beaches, crystal-clear waters and beautiful tropical scenery. Across the island, you'll find tucked-away Buddhist temples, a myriad of high-end resorts and plenty of fine-dining establishments. With winter just around the corner, many of us are already itching to escape the cool air and retreat to a warm-weather locale with powdery sands and swaying palms. From the colorful coral reefs of the Maldives to the unspoiled sands of Seychelles, these nine picturesque spots are ideal places to unwind and thaw out this winter. Along Kauai's rugged Na Pali coast you'll find the isolated Honopu Beach. Only accessible by kayak, boat or helicopter, Honopu Beach is especially enticing for beachgoers looking to get off the grid. If you would rather get your heart racing with a challenging hike than enjoy the coastal views from the sand, trek along the 11-mile Kalalau Trail, which packs in plenty of jaw-dropping vistas of the north shore. See: 6 of the Best Secret Beaches in the U.S. Beneath black volcanic rocks on the eastern side of the Bukit Peninsula you'll find Nusa Dua, a tranquil public beach filled with pristine sands and turquoise waters. Breaks from beachside lounging can include lavish spa treatments, hitting the links on a nearby golf course or surveying the peninsula's craggy cliffs. If you're craving calm waves and soft sands, head to Sanur Beach along the island's southern coastline. And if you're yearning for a little more adventure, Bali offers plenty of ancient temples to explore and volcanoes to climb. With magnificent coral reefs, crystal waters and palm-fringed beaches, the Maldives offers a postcard-worthy setting. Thanks to its 3,000 coral reefs, the Maldives is especially enticing for snorkelers and divers. When you need a break from exploring coral-rich waters, retreat to one of the island's lavish resorts. And for an especially memorable getaway, consider staying at the Shangri-La Villingili Resort and Spa, which boasts a private lagoon, ivory sands and stilted overwater villas. Filled with enormous granite boulders, chalky white sands and cerulean waters, Seychelles offers some of the most spectacular beaches in the world. 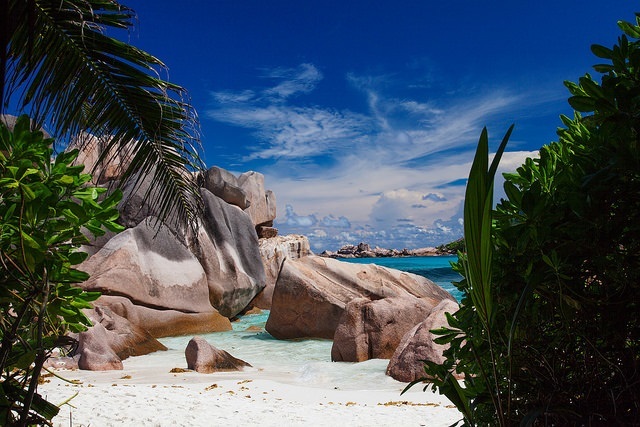 Anse Source d'Argent on La Digue beckons to those looking to lay down a towel next to towering boulders, while Anse Lazio on Praslin appeals to snorkelers with its impressive underwater life and warm waters. Whether you're craving utter seclusion or a change of scenery, Seychelles offers a relaxing, crowd-free getaway. Jamaica's laid-back vibes and spectacular sands make it a choice locale for winter-weary travelers eager to retreat somewhere warm. Visit Negril's Seven Mile Beach to soak up the sun and splendor, or if you're yearning for a little more activity, hit the links in Montego Bay or trek through Dunn's River Falls & Park. With its relaxed atmosphere and bright blue waters, Playa del Carmen offers a tranquil beach locale. Days here can be spent shopping along La Quinta Avenida and people-watching at chic beach clubs. Plus, you'll find plenty of all-inclusive properties and renowned golf courses here. Thailand's Koh Samui lures visitors in search of white-sand beaches, crystal-clear waters and beautiful tropical scenery. Across the island, you'll find tucked-away Buddhist temples, a myriad of high-end resorts and plenty of fine-dining establishments. And should you tire of sunbathing, you can explore a butterfly garden, check out cascading waterfalls or enjoy an indulgent spa treatment at Tamarind Springs. Though there's no one-size-fits-all beach destination that would suit everyone's needs and interests, Grand Cayman offers a winning mix of impressive dive sites, coral sands, casual eateries and opulent hotels, luring variety of beachgoers. The show-stopper here is Seven Mile Beach along Grand Cayman's western coast. This sandy, crescent-shaped stretch is often praised for its laid-back atmosphere, lovely coral and ample snorkeling opportunities in its calm, clear waters. If your dream beach getaway involves sunbathing, snorkeling or boating, Florida's Paradise Coast has you covered. Here, you can take breaks from sunbathing to shops or hit the links in Naples or enjoy a scenic sail along Marco Island. What's more, you'll find plenty of luxury resorts here, so when you tire of relaxing on the sand, you can enjoy memorable meals and top-notch spa treatments. Trained as an attorney at The University of Texas at Austin School of Law, Sery Kim is a Washington, D.C.- and New York City-based food and travel writer. Formerly, she spent more than eight years working in politics, including time spent working for the White House, two presidential campaigns and four years in Congress. Follow her on Twitter, Instagram or on her blog Adventures in Sery.